Our business is built on keeping customers like you happy! If you are ever less than completely satisfied with anything you order from us, we want to hear about it. 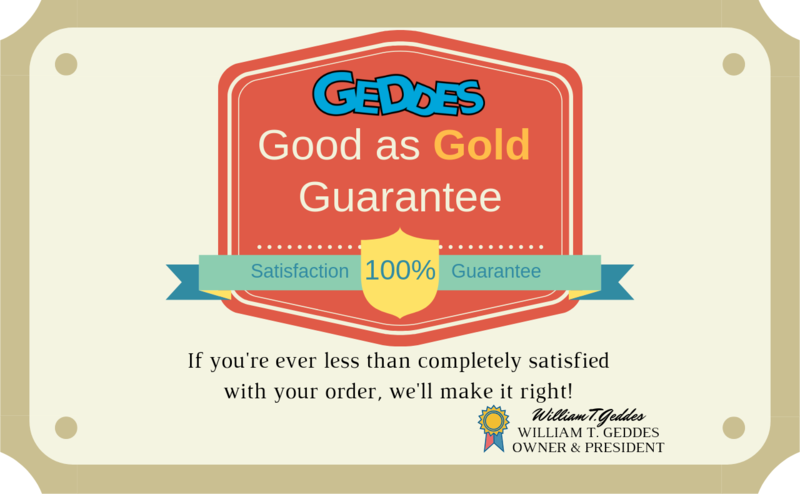 Raymond Geddes products are unconditionally guaranteed. If you are dissatisfied with your order or the items within your order, you can return the item for a refund or replacement. E-mail us at service@raymondgeddes.com or call 1-888-431-1722 (toll-free) and let us know about any problem. A Return Authorization is needed before we can schedule your return. Please see our Product Return page for more information. We've worked hard to develop a highly secure online ordering process - one that lets you shop and place orders with confidence. Credit card and personal information sent through our web site is encrypted. Once you log into your account your web browser's security mode is enabled. This encryption layer prevents other people from electronically accessing information you send to raymondgeddes.com.